Grand Central Station: exit at 42 St. walk right (west) to 5th Ave. - Go left (South) 3 blocks. Go right (West) to 15 W. 39 St. 3rd Fl. Port Authority Bus Terminal: exit on 8th Ave. walk right (South) to 39th St. 2 blocks. Go left (East) on 39th St. 3 1/2 blocks to 15 W. 39 St. 3rd Fl. 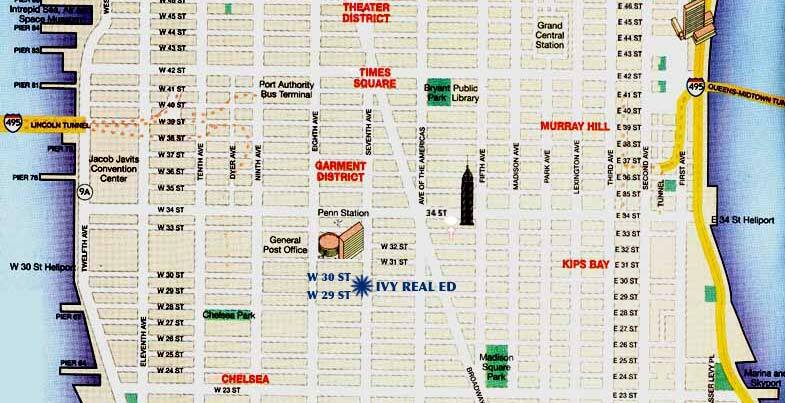 Penn Station: Walk left on 7th Ave. 7 blocks to 39 St. Go right (East) 2 1/2 blocks to 15 W. 39 St. 3rd Fl. Lincoln Tunnel: Go left exiting the tunnel. First right onto 40 St. drive 4 blocks turn right on 5th ave. first right to 39th St. Midtown Tunnel: Stay right follow signs to 39th St., right turn onto 3rd Ave., go 2 blocks & make a left on 39 St. go 4 1/2 blocks to 15 W. 39 St. 3rd Fl. Street Parking: closeby is not possible between 8 AM and 7 PM Monday thru Friday. You will be ticketed and towed. There are numerous spots available in the evenings and weekends. Always watch the parking regulation signs. Garage Parking: There are numerous garages in the neighborhood. The cost for a full day ranges from $30 to $40. .